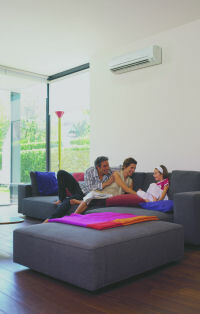 In the Energy Showroom we have installed the very latest Daikin wall mounted FTXS air conditioning unit. Featuring the current popular ‘designer’ style casings, all indoor units within the new FTXS/FTKS-E range have the same overall dimensions (290x1050x238mm) as existing 60 and 71 class FTXS/FTKS-B units. Maximum COPs of 3.63 and EERs of 3.23 position the new 50, 60 and 71 class combinations at the forefront of comparable systems as regards energy efficiency. The earlier 50 class CTXS/CTKS50-D indoor unit is replaced by a new FTXS/FTKS50-D model, which retains the original style and slightly smaller (283x800x195mm) casing but can now be used for both ‘pair’ and ‘multi’ instead of ‘multi’ only applications. Visual appeal has been afforded close attention and the indoor unit’s stylish flat design and striking optional all white or white and silver colour scheme blends harmoniously with any interior décor, whether traditional or modern. Several major technological refinements are incorporated within the outdoor units, including the advanced Daikin high torque, DC reluctance motor swing compressor. Featuring a concentrated winding structure with a 30% approximate reduction in copper loss and an 11% increase in cylinder volume and low frequency operation, the unit delivers reduced energy consumption, low vibration and operating noise with increased performance and reliability. The use of a DC fan motor increases efficiency across the motor speed range by between 20 and 40% over standard AC types whilst a new larger cubic capacity 2 row heat exchanger increases heat transfer, considerably. The provision of the company’s Titanium Apatite photo catalytic air purifying filter maximises absorption of microscopic particles, decomposes odours, removes bacteria and deactivates viruses. Titanium Apatite in fact, is 2.5 times more absorbent than the Titanium Oxide widely used in air purifiers, deactivating and decomposing more than 99.9% of influenza and staphylococcus aurea toxins that come into contact with it. A short video of the FTXS showing the key features and end-user benefits.